Pour ½ cup of the pomegranate juice into a bowl, sprinkle the gelatin on top, and let stand for 5 minutes. Meanwhile, heat half the remaining juice (¾ cup) just to the boiling point. Stir it into the gelatin, add the sugar, and stir until the gelatin is completely dissolved. Gradually stir in the rest of the juice, then add the orange-flower water. Divide among 4 to 6 small glasses and refrigerate until set, allowing at least 6 hours or overnight. Lightly heat the milk with the saffron threads and let cool. Stir the yogurt and honey together. Blend the saffron-milk mixture into the yogurt. Refrigerate until needed. 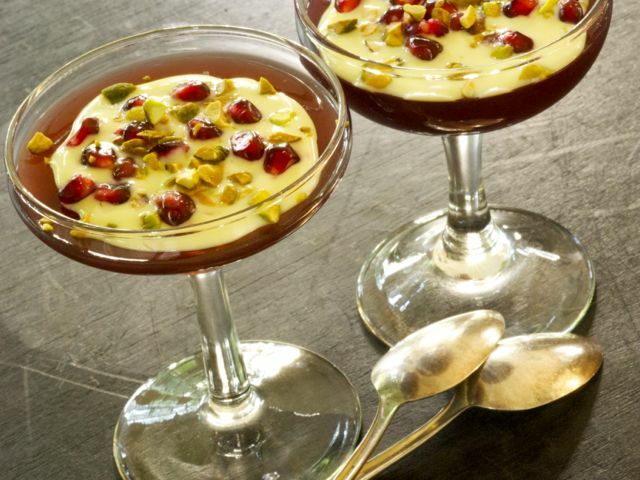 To serve, spoon the yogurt cream over each glass of pomegranate jelly. Garnish with the pistachio nuts and pomegranate seeds.